To manage Email Lists in Virtuous Marketing, click on the Settings menu and then select "Manage Email Lists." If your organization previously used the Email Groups feature, all of your existing Groups will be converted to Lists. Note: Organizations may have a maximum of 25 Email Lists. Click on "Create a List" to do just that. Email lists require a Name and a Description. These can both be seen by your recipients, so make sure your copy is donor-facing. 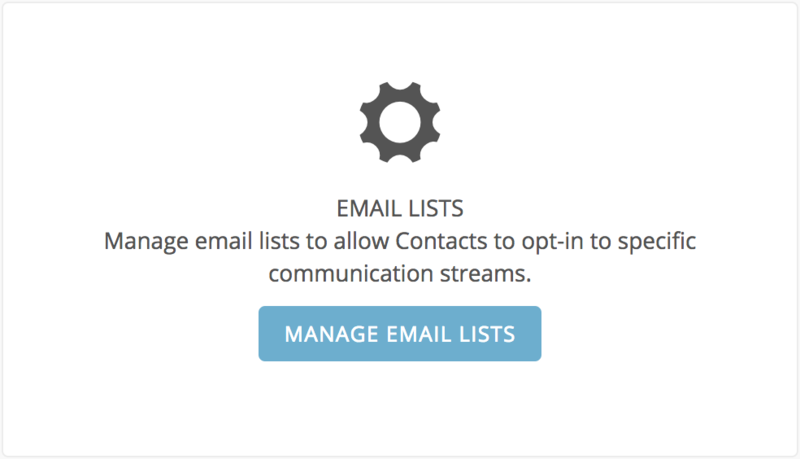 Users may choose to designate some Lists as "Default" lists, which means that they will always be displayed on the Subscription Preferences page for your email recipients. Once you have created a List, you may add Individuals to your List either one-at a time, on a Contact record, or in bulk, via an Individual query. On a Contact record, look for the Email Lists box in the lower left. 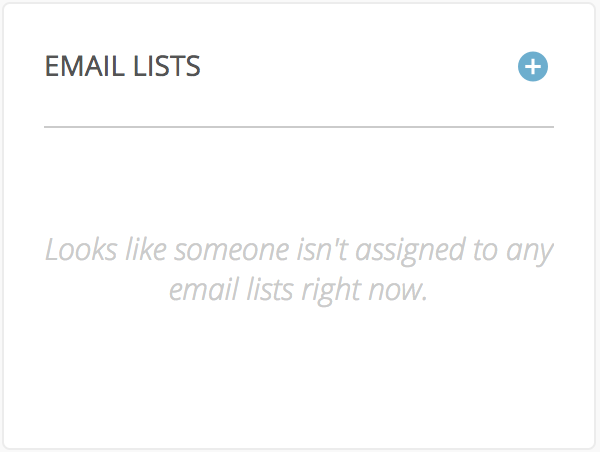 There, click to add any Individual from the record to an Email List. Click to select the desired Individual and then select the correct List to add them to. It is possible to select more than one Individual, and to select more than one List. Once Individuals have been added to a List, click to edit their List membership and either remove them from the List, or unsubscribe them from a particular List. Unsubscribed Individuals must be kept on a List in order to track their unsubscribe status. Global Unsubscribe: This link will allow recipients to unsubscribe from all future emails, regardless of the Email List used. (This includes email receipts). Group Unsubscribe: This link allows recipients to unsubscribe from the specific List used in sending them the email being created. So, if you are sending an email to the "General Appeals" list, an Individual can unsubscribe from future "General Appeals" emails, but may receive emails sent to other Lists. Subscription Preferences: This link allows a recipient to see a list of the Email List for the specific email they have just received, as well as any default Email Lists, and unsubscribe from any or all of them, whichever they choose. Unsubscribe actions can also be seen from the Sent Emails screen, when viewing Email Activity. Primary: Only the primary email address for the Primary Individual will be used. Primary and Secondary: If there are email addresses for both the Primary and Secondary Individuals on any records, both will receive the email. All: All Individuals with an email address will be sent the email. Sending an email using a Contact query will add all of the Individuals receiving the email to the Email List specified on the email, making it easier to manage future sends. 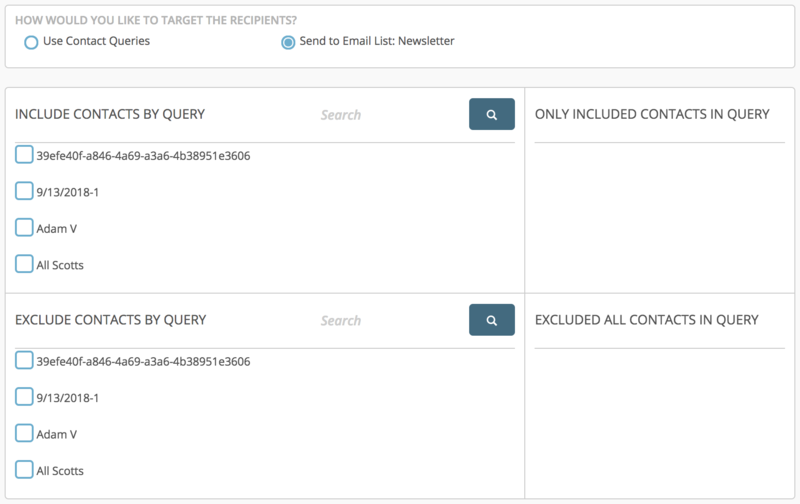 Selecting the Send to List option will allow fore the option of including or excluding specific records based on a Contact query, allowing for greater flexibility when sending an email.